For Frank’s birthday yesterday I made cupcakes. Usually we don’t make cakes for his birthday, not regular cakes. In the past I would often make a cheesecake for his birthday, or nothing, since he didn’t care as much about cakes as, say, the children would for their birthdays. Frank doesn’t care much for holiday trappings, would do fine without them, so he says and acts, but if I have the energy to do something, he doesn’t mind, I suppose. Maybe actually likes it. Holiday stuff for us is just “us” having no external family in the area we live in. THis makes it harder for me to get into all of it, compared to what I desire to have done, and could do when I was younger/single especially. Being older and a Mama of younger children is a hard job and something has to give. I had planned to do a couple of firework things we had leftover from our New Year’s home show. I wasn’t sure we’d be able to do that, it was raining/drizzling/dripping out most of the late afternoon, and even at 8:30pm when I last had checked, but I was hopeful that when 9pm rolled around there wouldn’t be wet stuff coming down at all, and it did work out that way! That was nice, a couple of TNT “Cuckoo” fountains and some flashing little things. Just something special, nothing big, something different. I hadn’t made anything cake-wise since I had made a cheesecake for Baby Q’s first birthday on June 23, not that long before. We didn’t want another so soon. So when it came time to make dinner I finally decided that wasn’t what I wanted and was inspired to make cupcakes. I made vanilla cupcakes and chocolate frosting. 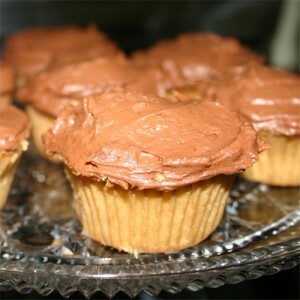 Nothing fancy, just simple homemade cupcakes, delicate and moist, with homemade chocolate buttercream frosting. Simply frosted. We had them after the fireworks, we didn’t do any candles on the cupcakes, not for big Frank. It was nice though, Happy Birthday singing was loud and full, the children really joining in for the first time for his birthday, so vibrantly at the least.